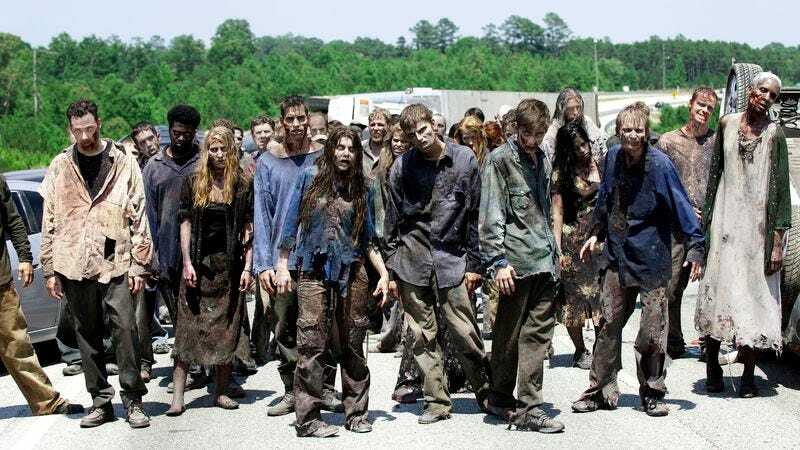 AMC has a new gimmick to ensure The Walking Dead fans check out their zombie spinoff show. According to Entertainment Weekly, the channel is putting together a one-off Fear The Walking Dead online special that’s set on an airplane overrun by zombies, a.k.a. walkers/biters/dead ones in the early days of the outbreak. Not only does that sound exactly like that scene from World War Z, it’s also not totally dissimilar from the Walking Dead webisodes AMC has put online before, like this one that explains the origins of the “Don’t Open, Dead Inside” warning Rick finds in the pilot. But there are two additional stunts here: One of the survivors of the airline attack will go on to join the cast of Fear The Walking Dead in season two, making this the first time a new character has been introduced in supplemental material. And in addition to its online premiere, the half-hour special will air in “chapters” during the commercial breaks of The Walking Dead. While we don’t yet know when these chapters will air, AMC is clearly hoping they’ll get Walking Dead fans invested in this new survivor, so much so that they tune back in for Fear The Walking Dead’s second season in 2016. Of course, given that Fear The Walking Dead already had the biggest cable debut ever, AMC doesn’t need to be too concerned about attracting new viewers. Fear The Walking Dead is currently airing Sundays on AMC, and The Walking Dead returns for its sixth season on October 11.